We should continually be striving to transform every art into a science: in the process, we advance the art. 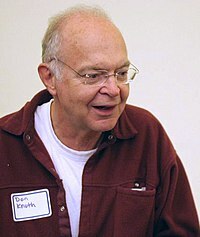 Donald Ervin Knuth (born 10 January 1938) is an American computer scientist, Professor Emeritus at Stanford University, and winner of the 1974 Turing Award. I can’t be as confident about computer science as I can about biology. Biology easily has 500 years of exciting problems to work on. It’s at that level. The psychological profiling [of a programmer] is mostly the ability to shift levels of abstraction, from low level to high level. To see something in the small and to see something in the large. The important thing, once you have enough to eat and a nice house, is what you can do for others, what you can contribute to the enterprise as a whole. The whole thing that makes a mathematician’s life worthwhile is that he gets the grudging admiration of three or four colleagues. I define UNIX as 30 definitions of regular expressions living under one roof. I can’t go to a restaurant and order food because I keep looking at the fonts on the menu. Knuth, Donald (2002). "All Questions Answered" (PDF). Notices of the AMS 49 (3): 321. How can you own [...] numbers? Numbers belong to the world. In his video account on the creation of TeX, he comments that Xerox offered to allow him to use their equipment, but that the fonts he created would belong to them. In fact, my main conclusion after spending ten years of my life working on the TEX project is that software is hard. It’s harder than anything else I’ve ever had to do. Knuth, Donald (2002). "All Questions Answered" (PDF). Notices of the AMS 49 (3): 320. If you find that you're spending almost all your time on theory, start turning some attention to practical things; it will improve your theories. If you find that you're spending almost all your time on practice, start turning some attention to theoretical things; it will improve your practice. The reason is not to glorify "bit chasing"; a more fundamental issue is at stake here: Numerical subroutines should deliver results that satisfy simple, useful mathematical laws whenever possible. [...] Without any underlying symmetry properties, the job of proving interesting results becomes extremely unpleasant. The enjoyment of one's tools is an essential ingredient of successful work. Variant in Knuth, "Structured Programming with Goto Statements". Computing Surveys 6:4 (December 1974), pp. 261–301, §1. Knuth refers to this as "Hoare's Dictum" 15 years later in "The Errors of Tex", Software—Practice & Experience 19:7 (July 1989), pp. 607–685. However, the attribution to C. A. R. Hoare is doubtful. To summarize: We have seen that computer programming is an art, because it applies accumulated knowledge to the world, because it requires skill and ingenuity, and especially because it produces objects of beauty. A programmer who subconsciously views himself as an artist will enjoy what he does and will do it better. Therefore we can be glad that people who lecture at computer conferences speak of the state of the Art. For his major contributions to the analysis of algorithms and the design of programming languages, and in particular for his contributions to the "art of computer programming" through his well-known books in a continuous series by this title. This page was last edited on 4 April 2019, at 13:56.